Kiddos will know they made the "nice list" when they open this personalized Christmas book. Your little one will know she made the "nice list" when she opens this sweet, personalized Christmas book. 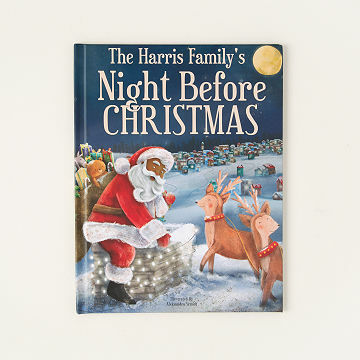 The classic 1823 poem on which this colorful book is based, "The Night Before Christmas," was originally intended for the children of the author, making it a perfect gift from parent to child. The child's name is sprinkled throughout the book, along with up to 4 names of other family members or close friends, and even a beloved pet. Perfect for children ages 0 to 12. Made in Minnesota. These are very unique books for my Great and Great Great Niece's. I will continue to buy these kinds of books every year. They are a wonderful keepsake. I have recommended this gift to all my friends with small children. It is amazing how the personalization works to make the story come alive for a child. The fact that you can have parents, grandparents, and even pets represented in it is fabulous! The art work was amazing as well. Definitely worth the $. This was a Christmas gift for my 20 month old grandson. He has toys coming out his ears as he is the only grandchild so far, so I wanted to do something different. This book is beautifully illustrated and has not only his name in the story, but also his parent's names on the stockings and gifts. His mom will be reading this book to him for years to come. I have nothing but positive things to say about this book. It exceeded even my highest expectations. I recommend this product to everyone. This is a sure-fire winner as a gift. What a GREAT gift that will be loved year after year! This will be enjoyed year AFTER year! It's a simple gift that brought a smile! Apostrophes plus the 's' is grammatically correct unless the name ends in an 's', then you just use an apostrophe without adding the 's'. I am a bit embarrassed about having to explain this mistake when we open gifts this Saturday. Professional companies should do professional work. I gave this to a friend's 5-year-old daughter for Christmas. It was personalized throughout and she absolutely loved it. Every page had a personal touch (her name and/or other family members) as part of the story. I think this is a thoughtful gift idea for anyone as this book is a classic. Love it and can't wait to give it to my niece. Especailly loved the note I could include on the first page.